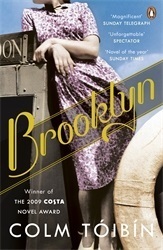 The novel Brooklyn by Colm Toibin is a truly remarkable feat of describing a the immigrant experience. Irish author Toibin describes the adventures of transformation of a young woman named Ellis who who moves from Ireland to Brooklyn in the 1950s. This novel was the source material for the critically-acclaimed film with the same name. The beauty of this book is that it is such a wonderfully-written coming-of-age story. Ellis moves to a new county and experiences a brand new culture, and naturally adjusts to her new environment while growing up at the same time. She finds a purpose. She experiences love and loss and hope. This novel takes its readers through the highs and lows of human experience all while framing the narrative with familiar cultural tropes. The atmosphere is wonderfully described. There is a definite sense of time and place. The descriptions of Ellis’ time in Brooklyn as well as in Ireland are distinct and filled with beautiful imagery that makes it easy to follow to visualize. This is a novel that deserved all its acclaim. I would think that readers who tend to prefer likable character-driven narratives will be the ones who are most drawn to this novel. While there is a plot, it moves slowly. It’s not uncomfortably slow; it’s just that action and event is not the main focus of the narrative, which is completely fine. Still, those used to more plot than character may not find this as magical as I did.